Valentino on the left. Schiaparelli on the right. Swooning all around. In an age of digital artifice and an increasingly homogenized landscape, clothes with this kind of old world craftsmanship feel special, unique and grounded. They're linked to an artistic tradition that goes back as far as human beings have been around to put threads into needles. For millennia, embroidery was considered a product of women's domesticity -- and, therefore, dismissed as irrelevant by the mostly male gatekeepers of the art world. Embroidery, however, was not simply for ornament. It told stories and even contained hidden messages. From Europe to the Middle East, Africa to the Americas, women stitched together intricate works of art and subversive symbols of political rebellion into everything from quilts to clothing. For a great read, check out: The Subversive Stitch, Embroidery and the Making of the Feminine by Rozsika Parker. This now-classic look at the reciprocal relationship between embroidery and women created quite a stir in art history circles when it was originally published, and was first to treat the craft of embroidery with the respect it deserves. Then again, when is Jared Leto's Instagram not a joyous eyeful? 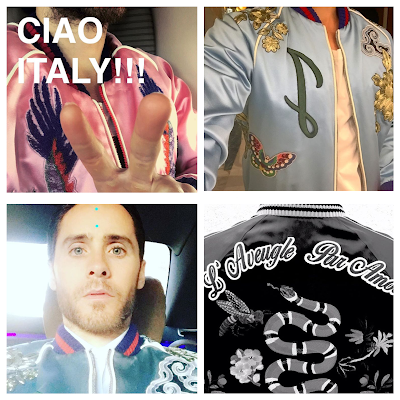 It's not hard to figure out where Alessandro Michele found his inspiration for these embroidered jackets. 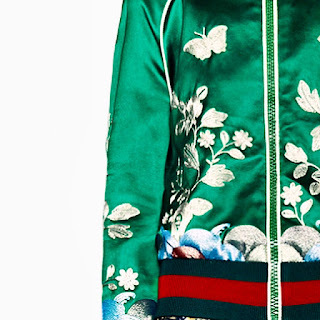 The Japanese souvenir jacket -- or sakujan -- has a long, storied history. When GIs who had been fighting in the Pacific returned from World War II, they brought souvenirs back with them. Since they had little space in their footlockers, and international shipping was slow and expensive, the soldiers found a unique way to commemorate their time overseas. While waiting to return home after the war, they employed traditional Japanese tailors and seamstresses to stitch patterns on the backs and sleeves of their actual bomber jackets. 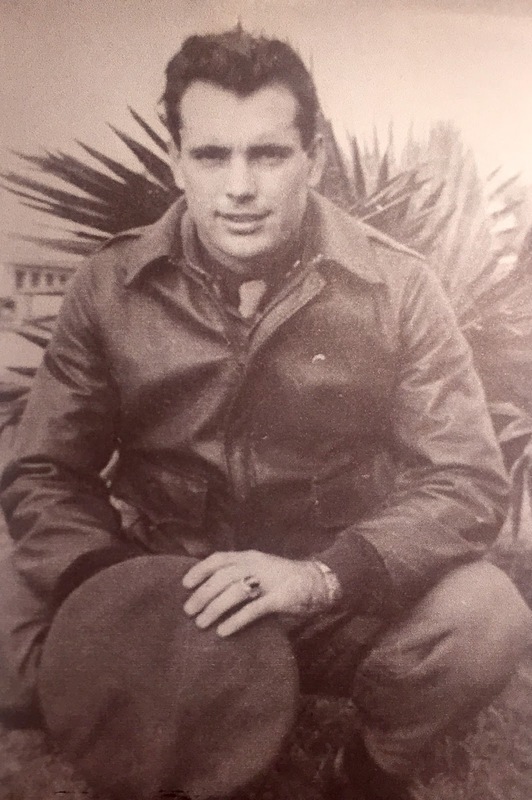 My father was the age of most of my friends' grandparents, so I grew up hearing his stories of fighting in WWII. He had flown in a B24 as a member of the Army Air Force combat unit in Okinawa. After the war ended, he served as part of the occupying forces in post-war Osaka and Tokyo. He didn't bring many things back from Japan, but he saved his old flight bomber jacket. When I was still in high school -- and passionate about vintage clothing --my dad took his jacket out of the mothball-loaded trunk it had been in for decades, and gave it to me. I wore it throughout my 20s, until the cuffs started unravelling and I packed it back up again. During the post-war occupation, my Dad removed the official Air Corps patches from his bomber jacket to have hand-stitched embroidery added by an Osaka seamstress as a souvenir. He said all the guys wanted to get rid of the war's official embellishments. While they were still in Japan, they wanted to leave behind the accoutrement of a war that took so long to end, especially since they were in a country only recently considered enemy -- and one that was desperately trying to regenerate, rebuild and heal from the horrors. The GIs also wanted to heal. Placing beautiful images on their war jackets was an act of transformation. Most of them wanted to turn those jackets into mementos for their sweethearts. I think there is something heroic and melancholy about the idea of turning war armor into works of art and tokens of affection. Alas, it never happened with my dad's jacket. The waiting list was too long to have it completed before he was sent home. My dad looked mighty dapper in his bomber jacket. 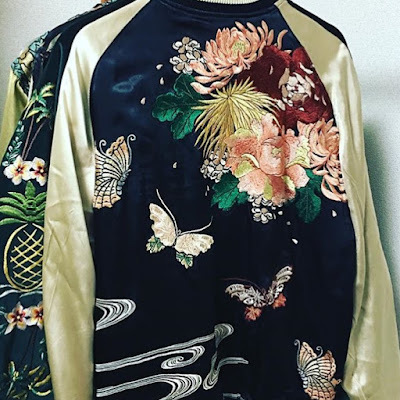 This practice of putting embroidery on bomber jackets turned into what we now know as the souvenir jacket, or sukajan: a satin bomber-style jacket with colorful embroidery on the chest, sleeves and back. The designs usually include the word Japan, or another region's name, across the back and above a large, colorful image. There were all kinds of Japanese motifs available post-war, but GIs were fond of embroidered dragons, tigers and phoenixes. Not only did these symbols represent the exoticism of Japan, but they honored the fierce quality of fighting, surviving, and transcending the war. The word sukujan is said to be an amalgamation of Sky Dragon Jumper in Japanese, but even this explanation is controversial. Some argue that the name came about because so many American soldiers were stationed in Yokosuka. When you combine Yokosuka with the Japanese word for "Jumper" you get Sukajan. Maybe this is true, but I still like Sky Dragon Jumper better. You can still find vintage sukajan jackets on Ebay and Etsy. Trust me, click on those links only if you want to go down a rabbit hole, emerging after you have taken out a payday loan to cover your new addiction. I love this so much, I have no words. There are also plenty of souvenir-style jackets made elsewhere. Come on! I had to add this to my coat closet. As the years after World War II progressed, American culture infiltrated Japan, including the incorporation of many American-style aspects of art, music, culture and clothing. In the 1960s, the streets of Japan were filled with youths happily wearing preppy oxford shirts and penny loafers while listening to Elvis. Some people called it a lovely cultural exchange, but others saw it as yet another occupation of the East by the West. For a fascinating read about the rise of American fashion in Japan -- and how Japanese designers preserved and promoted it -- check out: Ametora: How Japan Saved American Style, by David Marx. Next year, the designers will move on to other influences, but it's doubtful that anyone will ever lump their gorgeous 2016 embroidered jackets into the category of passing trend. The inspiration behind them is too rich and historic, and the style is too unique and interesting. (Not to mention beautiful!) What other item of clothing represents war, loss, survival, transcendence, love for a sweetheart, association with crime and Harajuku street style? Be sure to watch the great Harajuku interviews in the video at the top of this post. Want to leave a comment? Head over to the Chic Contraire Community Forum and start a conversation! Make Up Tutorials from History ... Yikes!